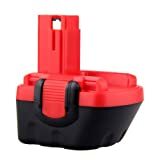 Generic 12V,2000mAh Ni-Cd Replacement Cordless Power Tool Drill Battery for Bosch 26073 35249, 26073 35261, 26073 35262,26073 35273, 26073 35274, 26073 35375 ,Compatible Part Numbers:BAT043, BAT045, BAT046, BAT049, BAT120, BAT139 , selling for $27.99 brand new. Manufactured by Creeracity. There are 3 units left brand new. Meets or exceeds original specification.